I'm trialing a population of F2 Citrange seedlings this winter in zone 6b in SE PA. There is considerable variability in the resistance to low temperatures, with some dying in November and others still viable at this point. The population is a mixture of nucellar F1 and zygotic F2 seedlings. The F1 are freezing out at present, but a number of the F2 are surpassing the F1 in hardiness and a few appear to be surviving the winter. My hope is that several will approach the hardiness of P. trifoliata. Any survivors would then be evaluated for palatability. My focus is centered on hardiness, with palatability being secondary. I've grown poncirus since 1980 and lost everything above the snowdrifts in Jan of 1994. This was after 2 consecutive nights at -24 F. The trees resprouted below the snow height and haven't been injured since. kumin, Thanks for this information. Where are you growing poncirus? Full sun, partial shade, protected from the wind? 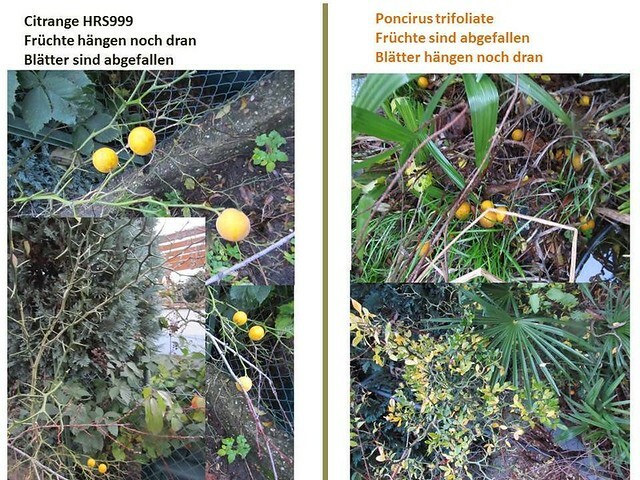 Have you noticed any difference between poncirus plants? hardyvermont, I have Poncirus plantings at three locations on the same property. All are in clay soil, one location is well drained , the remaining two are poorly drained. The trees growing in full sun have the the most vigor. Last winter I removed a M. Grandiflora tree that was shading the largest Poncirus tree and upon release the Poncirus tree responded positively. Most of my trees are fairly close to buildings which could block or concentrate the wind. I haven't recently germinated Poncirus seedlings on large scale. When I did in the past, I saw the occasional seedling I suspected of being tetraploid. Due to generally having rather high % of nucellar (clonal copies) seedlings, one usually sees a lot of uniformity. The citranges by contrast have no wind protection other than the density at which they're planted. They are planted at about 20 seedlings per sq. ft.
hardyvermont, I lost a planting of first year Poncirus a few decades ago by planting them into loosely cultivated soil and not allowing the soil to solidify during the growing season. During the winter 500-600 succumbed to late winter frost heave. In early April I could very easily pull the dead trees out by hand. They were approximately a foot tall at that time. There were no survivors. Mulching the soil might have saved them all. What is your source of citrange seeds? I'm glad to know someone else in the USA is growing F2 citrus x trifoliate hybrids. But mine are still at the tiny seedling stage, certainly not ready to face zone 6 winter. In fact, I assume I'll need at least one backcross to trifoliate, maybe two. I would love it if you proved me wrong. Walt, being of similar age as you, I am using brute force (large populations) in an attempt to increase the odds of obtaining very hardy F2 segentranges in a short time span. After planting a number of putative " cold hardy " cultivars that failed, I am seeking plants with nearly the full hardiness of Poncirus. I began with an initial population of 20,000+ seedlings. The seedlings are 85% nucellar and 15% zygotic, so the effective population under trial is 3,000 plants. The seeds were germinated in April of 2018 and planted outdoors in June, 2018. These plants are not protected against the cold in any way. Survivors, if any, will be protected going forward, knowing they have the necessary genetics. At this point the population will be very small and easier to protect. Googling "citrus tree seed California" will give you 2 hits that sell seed by liter or quart. If you need details on how to germinate large quantities of Citrus seed I can't make a recommendation, but I can tell you how I did mine. Check out the Hamlin x FD: http://tropicalfruitforum.com/index.php?topic=28270.msg321750#msg321750. It appears to be rather coldhardy. 3,000 is a number I can respect. I stated in long term cold hardy thread why I think F2 citranges will be less cold hardy than than F1. But 3,000 trys? If I'm wrong about even one of them, you win. This is a real effort. I think your chances would be better with older trees. But you are doing a big job, so do it your way and I hope you succeed. Thanks for the information about seed source. HamlinxFD is certainly not hardy in zone 6. I wonder if citrandarins like US852 are better choice for such large scale testings. I guess 5-10 mother plants will give sufficient quantities of starting seeds. For the germination, from my experience, the best method is perlite/buggy approach used for palm seeds. Seeds are germinated in zip locked plastic bag in moist, but not wet perlite at 25C. After germination seedlings can be transplanted in common pots to grow under artificial light and transplanted in spring in the open ground. I am germinating each season around thousand of seeds by this method (my record is 3000), selection to discard nucellar seedlings and plants with poncirus aftertaste in leaves can be done very early, before open ground planting. I just looked at my germinating US852 seeds. Four of them had begun sprouting, and of those 2 of them were polyembryonic and 2 only had single sprouts. 3,000 is a little less impressive than it sounds, approximately half are genetically dwarf which is not unusual for F2 zygotic citranges. Many of them are too lacking in vigor to hold much promise. Long story short- I did a status survey today and believe 100 to 150 plants are relatively unscathed, but February can be brutal to plants. Some winter cold damage is accumulative, as any individual cold event can be. The best looking plants phenotypically favor Poncirus rather strongly. However, they are not identical to one another in appearance. Hopefully they will carry some Citrus genes. The germination technique I used, was placing the seeds in mesh bags, then using a repurposed dishwasher with thermostatic control of water temperature, aerated/soaked them for 24 hours at 86 degrees F. I then removed them and scarified the seed coat for 30 minutes, followed by neutralizing the solution and rinsing them thoroughly. They were then returned to another 24 hrs of soaking, followed by planting immediately into a germination bed, again at 86 degrees F. They were planted 1.8 - 2 millimeters deep. Areas cooler than 86 degrees had a bit of seed decay. Seeds planted too shallow lifted out of the soil. Seeds planted too deep had delayed emergence. Emergence began at 7 days and continued a little over a week. The seed soaking procedure was used, as the seed was stored, dry seed. This would be unnecessary with fresh seed. Soaking the seed helps to synchronize the germination and subsequent emergence of seedlings. The water used in the soak was slightly chlorinated to prevent decay. The water was drained and replaced every 6 hours. As the seedlings grew larger and May weather became warmer the bed temperature was dropped to 75 deg. F. The seedlings were field planted on June 12, 2018. By end of September the tallest seedlings were 48" tall. The average was closer to 30" - 36 ' tall. Ilya 11 Thanks for your suggestion of a leaf taste test. During field planting I noticed some plants were pleasantly sweetly aromatic, but I didn't trust that there was a definitive correlation between plant sap taste and fruit taste. Relying on such a test could dramatically reduce the time, labor, space, etc. required to plant seedlings. Yes, US 852 is a hybrid between Changsha mandarin (already pretty hardy) and trifoliate, and can survive well into zone 7. Apparently their flavor isn't too terrible. There's a video where one guy is managing to enjoy eating them. I've been away from my computer a few hours, but this hasn't been out of my mind. Kumin. your results so far alreadyshow that I was wrong that all the F2 would be less hardy than the F1. You said ALL your F1s are dead, but some of your F2s live. I really didn't expect that. Photos taken yesterday of one plant lacking hardiness and one showing little damage. I then removed them and stratified the seed coat for 30 minutes, followed by neutralizing the solution and rinsing them thoroughly. I do not understand what do you mean by stratification? Certainly not cold treatment, may be washing soda incubation? Your brute force approach is very impressive, hopefully it will produce some hybrids as resistant as poncirus. Still, most of the freeze damage occurs in spring when small stem cracks begin to be infected. Ilya11, Yes, it was a strictly controlled alkali treatment followed by water flushing, again followed by weak acid rinse. then flushed repeatedly. At this point the final 24 hour soak was begun. I've just noticed I referred to the process as "stratification" my intent was to say "scarification". kumin, you are doing impressive work! Just a notification there is a Citrandarin F2 (but it could be F3 too) in Germany fully hardy and very similiar to Poncirus but not zone 6 more like zone 7. It is a HRS 899 (or offspring of it) but unknown which one. There are (or were) HRS 899 a to k . All HRS 899 are offspring of US852 or another hybrid with Changsha x Poncirus parentage. Thanks, Mikkel the reversal of the hybrid retaining the fruit while dropping the leaves is interesting. One aspect of Poncirus fruit is the rapid dropping of the fruit followed by short storage life. I have no experience with the variability of Poncirus hybrids fruit storage life. I have the feeling this picture might be yours? Is it? I knew it We had some contact then. Shall I put your name under the picture? Is this 899 above the same as the pear shaped one you posted in the other thread? Concerning the picture all is okay! On the first view I think it is the same HRA 899 selection. If helpful can check this in my garden to a later time. - But which selection is it? The foliage is mostly trifoliate. Thank you also for the hint to find the description of Bernhard Voss- I catched the direct link to this descritption: https://web.archive.org/web/20130106094639fw_/http://www.agrumi-voss.de/hrs.htm -> This description is very old and it is related to the habitus of relatively young plants. It is possible that shape and size of foliage varies during aging. So a more actual description including fruits would be very interesting. Do you know if Bernhard Voss has done any newer documentation of the HRS899 selections - may be he published a book about those or has written something about them in an article in a garden journal?